The Cerrro de Mercado apatites are a Mexican classic, and now its quite hard to find nice ones. I try to purchase any decent piece I see since I think these are still undervalued and destined to be good investments. These were once plentiful, although undamaged crystals and good matrix piece were never very common. This example is in very good condition and an esthetic matrix piece as well. The main 3.4 CM crystal is quite sharp, gemmy and is well placed on the matrix. The small specimen has good presence and glass like luster. There are a few other tiny crystals scattered about although some are damaged they are not visible from the display side. 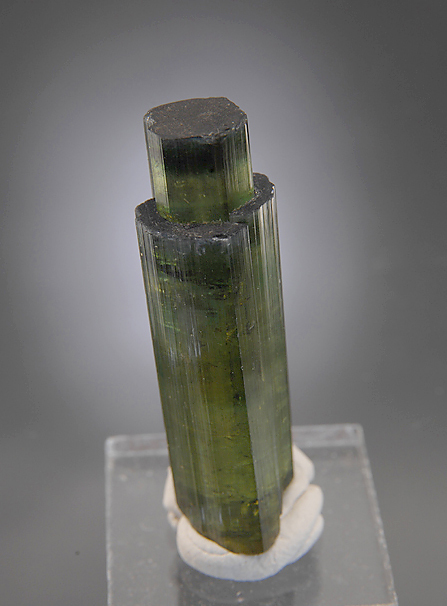 A fine zoned green gem crystal with a remarkable and rare termination. This looks like a reversed scepter as the inner termination rises above the base prism. Very sharp and clean, there are some very tiny chips on a few edges but not distracting at all. 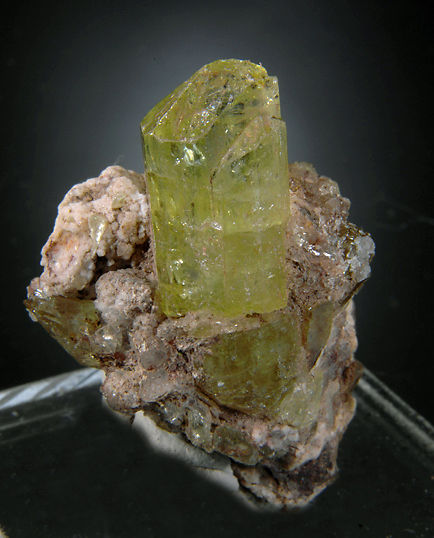 Pretty much all gem with green color ranging from yellowish to a deeper bottle green color. Rich deep orange color and glassy luster make this a very good eyecatcher. Crystals reach 2.4 CM in with many complete and well positioned. There is damage but in contect it is easy to overlook, yet it keeps this from a much higher price point. 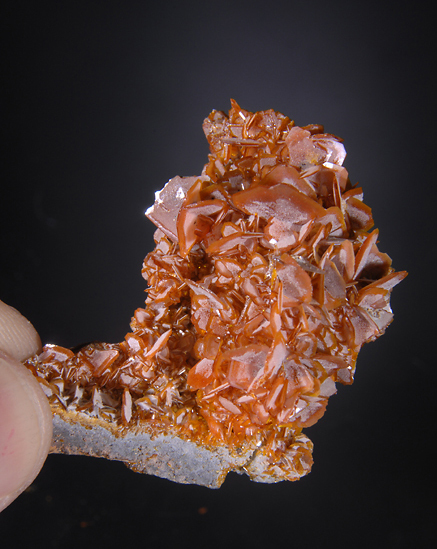 A very cute and sparkling wulfenite cluster of delicate thin blades on a shard of matrix. some minor cerussite as well, but mostly wulfenite in crystals to just under 1 cm. Some chipped crystals can be found but as these are thinner than paper and incredibly fragile it is forgivable due to the many undamaged crystals. A very pretty Wulfenite for the price! 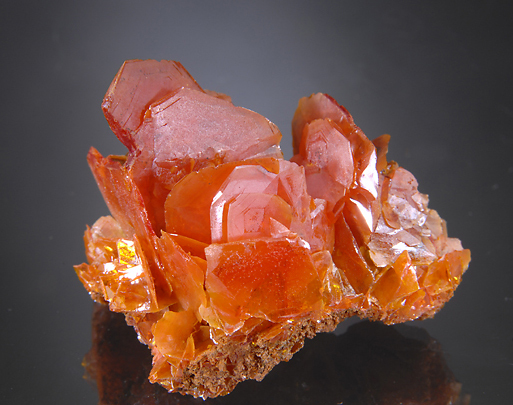 A very unusual and attractive Wulfenite of exceptional delicacy. This is an unusual habit for this find (and almost all wulfenite localities) that is a little like some older San Fransisco Mine and Tiger pieces, but not quite. This habit has irregular shaped blades with thin, tapered edges and seem to be complexly recrystalized and so seem very rounded and less geometric. The crystals are insanely thin sometimes thinner than a piece of paper. Consequentially there is edge damage in many areas, and some breakage but many of the larger crystals are relatively good and complete. For this ultra delicate style this is the best condition example I have seen, it A good piece for the collector who seeks the unusual and can accept some damage. Fantastic bright red-orange color and eyecatching form, this is a very 3- dimensional crystal cluster. 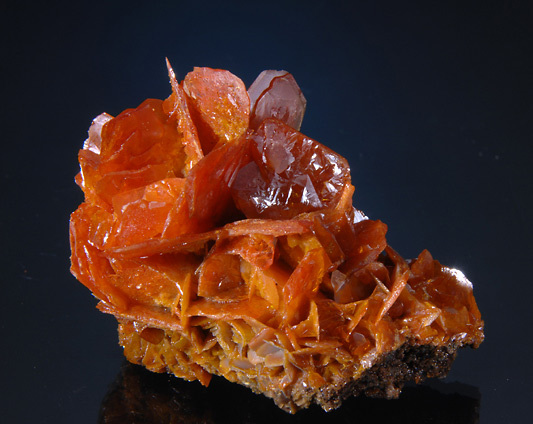 There is almost no matrix, just interlocked bright wulfenite. Some damage can be found but not badly detracting most of the major crystals are quite good and the overall quality is fine. 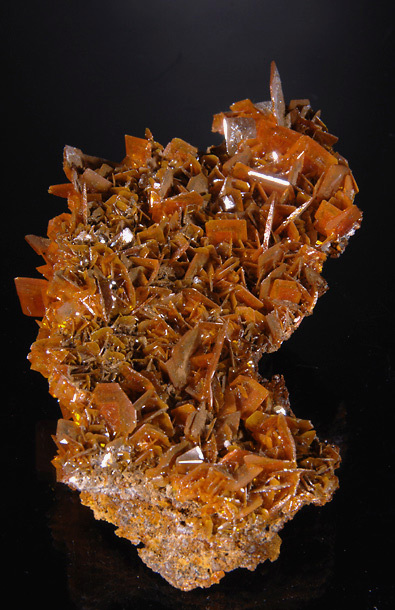 This wulfenite has unusual geometric outlines on some crystals that show complex parellel intergrowths. Good luster and presentation, a very good value. 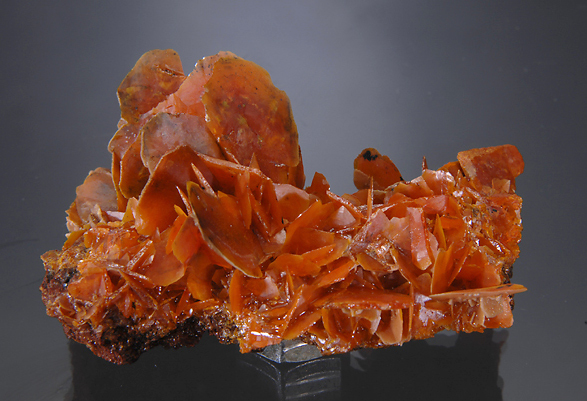 Outstanding glassy red Wulfenites cover a gossan matrix and reach up to 1 cm. Only a few broken crystals among dozens that are perfect. These delicate wulfenites are mostly gemmy all have vivid color. Some of the smaller crystals look much like Red Cloud wulfenites but the larger ones are thinner and more fragile. 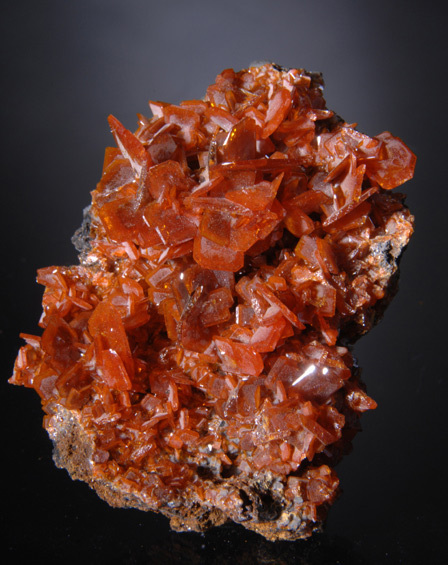 A sizable matrix covered with orange brown wulfenites that are very glassy on one side and coated with a rust like coating on the other. Delicate crystals to 1.4 CM (most are smaller) that are paper thin and sparkling. There are some areas of damaged crystals as can be seen in the photos, but many are pristine. Very good impact overall with sparkling glasslike blades and attractive color.